Benazir Bhutto died in an apparent suicide bombing in Rawalpindi today. Inna Lillaha Wa Inna Ilaihe Rajeoon. May her soul rest in peace. The increasing violence in Pakistan, witnessed recently, will further intensify after Benazir's assassination. Regardless of one's political views, this assassination must be condemned in the strongest possible terms and fully investigated and perpetrators brought to justice. Let us hope that the country does not descend into full-scale civil war. May Allah guide us all in this difficult period and protect Pakistan. Amen. 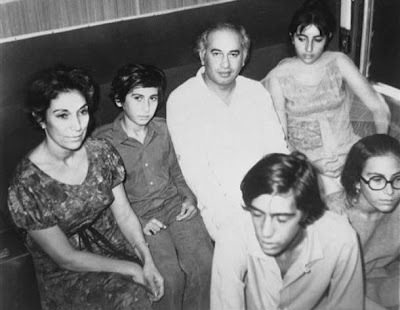 The Bhutto family, sitting left to right in back row: Nusrat, Shahnawaz, Zulifiqar Ali, Sanam. In front, Murtaza and Benazir. Regardless how anyone want to place the facts and unfold the story, the precisely planned killing of Benazir Bhutto is itself a reality pointing out clearly that actually she was the real threat to the forces working against Pakistan. May her soul rest in peace. May Allah help her family to bear this irrepairable loss and give Pakistan a leadership that can project the saner image of the country and true Islam. Today, while the ex-cabinet members who claim that they were highly intrumental in crushing terrorism in the northern areas and Lal Masjid, are addressing the rallies without suicidal attacks, it needs serious thinking as why Benazir was the target of suicidal attack? Why she was not attacked in the rallies held in the northern areas and why right under the nose of GHQ? If Baitullah Mahsood is behind the attack (as per latest version of the govt.) and govt. tapped the conversation right at the time when congratulations were being exchanged, how close the govt. is sitting while doing nothing? At the time of her killing, was she a threat to Baitullah Mahsood or to Musharraf and Muslim League (Q)? Under the given circumstances was the killing initiated by Baitullah Mahsood or he conducted the opreration for someone else? We are not children. We know very well that if Indian agencies plan a bomb blast in Pakistan, the name of the attacker would be Abdullah and if Pakistani agencies would do a job in India, the culprit would be Mukesh Sharma. Patriotism of Pakistanis could be tested any where in the world by asking them to help their country in rainy days but what about super class of people (richest fuedals, industrialists, drug lords and above all the politicians who successfully run the highly profitable business of politics in the Pakistan. An estimated rate of profit in Pakistani politics is 1000 to million per cent, details can be calculated by politicians increasing wealth. Majority of Pakistanis living abroad are labor class and highly skilled professional. No body give them money for nothing. They have to work hard for it. Some of them are businessmen who also work very hard to earn their fortune. There is no favor or nepotism in open markets of the world. After all these hard work they should give money to the country because few people of super class have taken country wealth abroad. I have lived and worked in Middle East and visited Europe and now living in USA for last 10 years, I found average Pakistan more patriotic that upper class of the country. We are ready to come forward again and will help/ invest in the country but this upper class should be stopped to taking national wealth abroad and participate accordingly in saving and investing in the country. At present two richest group of politician in power, they should provide the biggest share instead of going for begging to the rich nations. The richest nations are not rich by begging but by hard work. The upper class should go and observe how hard Chinese are working, come to USA and observe how people work and live here.The government of Pakistan should imediatly issue foreign currency investment bond offering good rate of return still better than IMF and world Bank, We Pakistanis abroad will buy with our savings and is a great help. The bonds should be gaureneted by international authorities The editor of Pakistan Times is a talented lady who invite us to write these comments. Her services are highly appreciated by Pakistanis living abroad. Pray for the country where majority population is helpless in front of few exploiters of supper class of rich politicians and defense forces have no choice but to defend them in the system. All the best. KHWAJA AFTAB ALI, Advocate & I.P. Attorney, presently residing in Florida, USA.